Blunt trauma experienced exactly to the wrong place can easily result in bruising both to the entire area "hit", and also to an underlying blood vessel. On average, these types of injuries tend to be relatively inconsequential when no broken bones or fractures are associated with the injury. 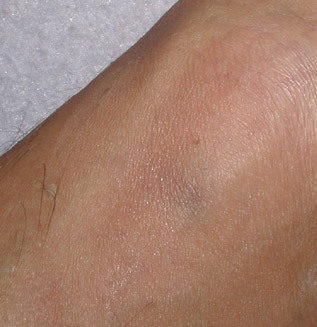 The bruises tend to swell significantly and are usually quite painful for days. 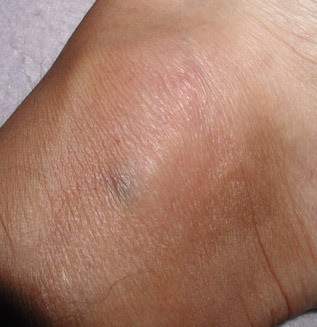 With bruises and injuries to a foot or ankle, the condition can be aggravated and the healing prolonged if one must spend long hours working that require walking or otherwise requiring constant pressure applied to the effected foot. Luckily, all of the pain, swelling, and potential setbacks to such an injury can be avoided completely -- if one has pre-prepared healing clay on hand, and applies a thick clay pack or wrap to the effected area. Three minutes after the ankle injury. Notice the swelling to the entire ankle area, but especially to the bruised blood vessel. 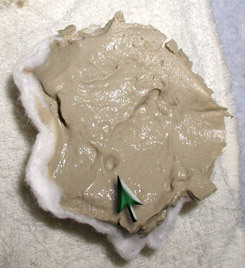 Picture taken after the removal of first clay pack, two hours later. 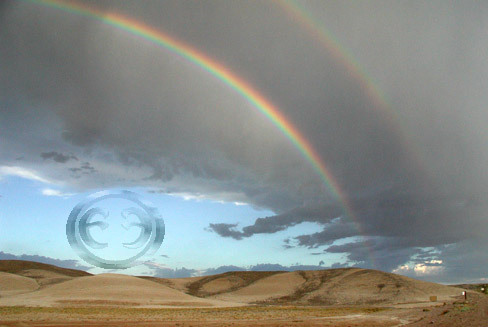 The pain previously at the injured area was completely gone, and the strength of the ankle returned to normal. Immediately following the injury, a large clay pack was placed over the entire ankle area, about two inches thick. The clay was covered with a clean white cloth, and a second larger cloth was wrapped around the foot, securing the clay in place. Notice that the clay wrap doesn't have to be fancy. At that moment, I utilized the closest "raw materials" I could find, and simply made certain that the clay was secured in place, so that it remained over the treatment location without compressing it. 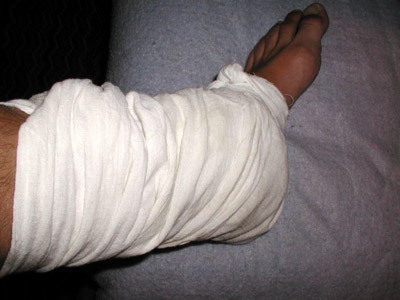 After removing the clay wrap and disposing of the clay, it was decided that treatment should be continued, to be certain that the body's healing cycle was adequately supported. For the second treatment, less clay was required, as swelling was no longer an issue. The clay applied was roughly an inch and a half thick. Since time was no longer a critical factor, a much better job could be done with the clay pack and the associated wrapping. Since this clay would be left on for a longer period of time, it was advantageous to take a bit more time with the wrap, to allow as much comfort and mobility as possible. 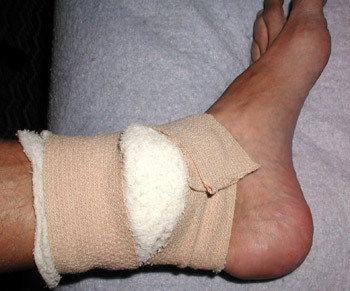 A cotton facial cleansing pad ( pure cotton ) was used to cover the ankle area. The clay was applied first to the pad, and then the pad was applied to the treatment area. Next, a clean white cloth was applied over the cotton pad. Two self-securing "ace bandages" were used to secure the clay pack in place. It turned out to be a good choice to do a follow-up treatment. 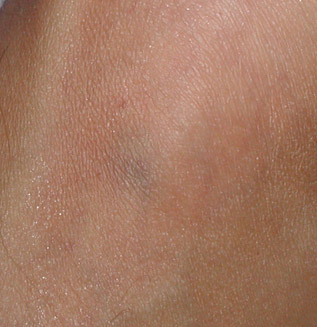 Immediately upon application of the clay, the area began to hurt. The pain subsided within a few minutes, but the pain response is an indicator that the clay action would still provide benefit.